I’ve talked before about the weather and natural disasters that occur in Japan. From the volcanoes (Kagoshima a few weeks ago) to the earthquakes and threat of a tidal wave, Japan has quite an array of weather and natural events that can occur. Living in Florida, we deal with hurricanes, tornadoes, and tons of lightning. But one I haven’t mentioned before are typhoons and one is coming right at Japan with Tokyo in its eyes. Typhoon Man-Yi, with winds pushing 100 MPH, hit Japan and has moved up the cost, avoiding Tokyo but putting more fear and pressure on the Fukushima plant as they continue to deal with that mess there. A typhoon is something that a Florida boy like myself has dealt with, a hurricane (just a different name). I remember in 2007 when Florida was hit with 4 hurricanes that year. My hometown shut down, we didn’t have power for a week, and it was a tough time. I would sweat to death at night in 90 degree, humid heat, just to wake up the next day to clean up debris in the area. 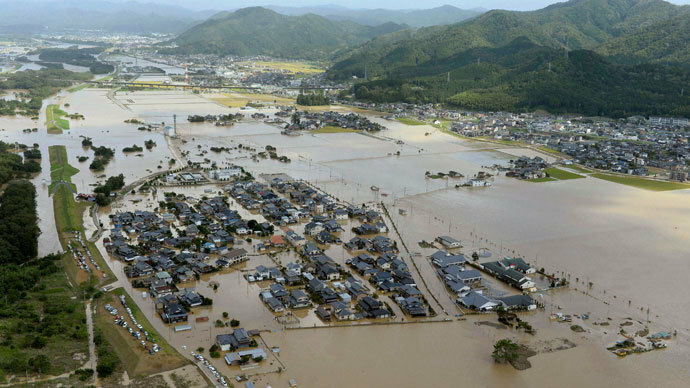 The storm that has hit Japan has left many areas washed out, mudslides and other major problems that the country now has to clean up and rebuild after. It has also claimed several lives showing how strong these storms can be. This is just something else to make note of and have plans for flight delays and know where the embassy is for us when we do visit. We are visiting in May, not the rainy season or storm season for Japan, but mother nature does what she wants so we need to be prepared for this and any kind of natural disaster what could arise in Japan.